One of the most notable periods of the infamous Friday night death slot for television shows was from the fall of 1993 to early 1996 on the Fox network. This was when The X-Files sat in the 9 o’clock Friday time slot. Four of the five shows in the 8 o’clock slot lasted only a year (or less). It wasn’t until Sliders moved to the 8 o’clock slot for its second season that a show survived more than a year in there. Of course more shows would later die on Fox Friday nights, including that one show that some people just can’t let go of. I may write about those later but for now I’ll write about the four shows that died during the X-Files years. I watched all of them when they aired though I don’t remember all of them clearly. They weren’t all my cup of tea but each had something interesting about them.. Here they are in the order they aired, which happens to also be the order of how much I liked them. I’ve avoided major spoilers in the descriptions of each show. Brisco is the son of legendary lawman Brisco County, Sr. When his father is murdered, Harvard schooled lawyer Brisco turns bounty hunter to track down the outlaws responsible. Complications include a rival bounty hunter, a grifting saloon singer, an eccentric scientist, and a mysterious Orb with strange powers. 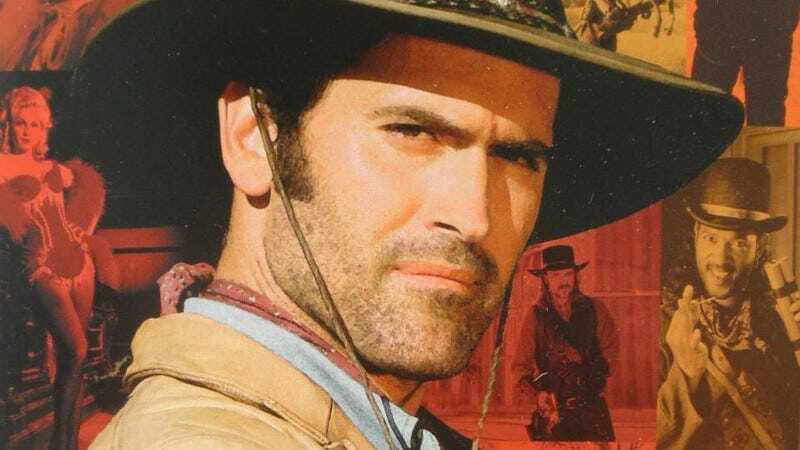 As you expect with a Bruce Campbell show there is a lot humor and the tone of the show has been called just under over-the-top. I liked this show so much I own it on DVD. I grew up watching reruns of The Wild Wild West so I was the target audience for a steampunk Western. Bruce Campbell playing the title character was icing on the cake. After being shot in the spine and paralyzed from the waist down, wealthy doctor Miles Hawkins develops an exoskeleton that allows him to walk (and has a few other abilities). Hawkins uses his exoskeleton and other high tech gear to become the vigilante M.A.N.T.I.S. (Mechanically Augmented Neuro Transmitter Interception System). In the original pilot not just Hawkins but all the supporting cast were black (including Gina Torres as a medical examiner). When the show premiered in the fall of 1994 only Carl Lumbly remained playing Hawkins. The show had a lot of issues leading to retooling halfway through the season and never gained the ratings needed to succeed. Sydney Bloom is a phone company linesperson by day and tinkers with computers in her spare time. She finds a way to enter an advanced form of virtual reality (the fifth level, hence the title VR.5) that affects the real world. She is recruited to carry out assignments in that VR by a shadowy group called the Committee. How is all this related to her late father’s work in virtual reality? This was a trippy show though a lot of the effects look horribly dated now. Freelance photographer Chance Harper has a strange form of luck that leads him to getting involved in other people’s problems. It’s sort of like Early Edition but with a different magic plot device. Would these shows have lasted longer in a different time slot? Maybe, maybe not. But I think any of them could be work today (not necessarily a reboot, just take the premise and try it again).